Michelle's Large Family Living (Angel Wings Homeschool): Doterra "HOT MESS"
My go to stress, anxiety, irritated days. 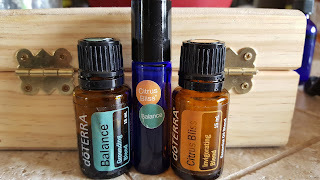 "HOT MESS" 20 drops of Balance and 5 drops of citrus bliss in a 10 ml roller bottle topped with fractionated coconut oil. Roll on either (or all😄) back of neck, temples, wrists and bottoms of feet. Amazing I use multiple times a day.